The Nikon 85mm AF-S DX ƒ/3.5G VR Micro was announced in October 2009, promising full 1:1 macro magnification with a minimum close-focusing distance of just under twelve inches. As a DX lens, the 85mm ƒ/3.5 VR is compatible with both DX- and FX-sensor based digital cameras, though the latter will provide a vignetted image unless used in the DX crop mode. The effective field of view in DX mode, or on a DX sensor-based camera, is 128mm. The 85mm ƒ/3.5 VR micro ships with the HB-37 lens hood, a bayonet-mounted circular lens hood. The lens takes 52mm filters, and is available now for approximately $530. The 85mm AF-S ƒ/3.5G VR Micro is a sharp lens, though it must be stopped down to obtain maximal results for sharpness. 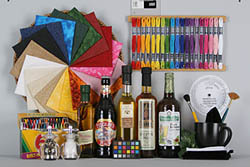 Used wide open at ƒ/3.5, the lens shows results in the area of 1.5 blur units across the majority of the frame, with a slight pocket of corner softness in the top left to the tune of 3 blur units. Curiously this corner gets slightly worse at ƒ/4, while the rest of the frame gets slightly sharper, and then at ƒ/5.6 overall sharpness is improved. By ƒ/8 some excellent results for sharpness appear, at 1 blur unit across the frame (and two units in the top left corner), the corner drops to 1.5 blur units at ƒ/11, and diffraction limiting sets in at ƒ/16 where the entire frame shows 1.5 blur units. By ƒ/22 it's 2 blur units across the frame, and ƒ/32 shows just over 2 blur units. Macro photography typically demands small apertures to obtain as much depth of field as possible, and Nikon has done a good job in preserving sharpness even as the aperture is stopped down significantly. Resistance to chromatic aberration is quite impressive for this lens, considering we noted a very low presence of CA despite testing the lens on the D200 (which doesn't feature automatic CA reduction as do the more modern Nikon digital bodies). Corner shading is only a marginal factor, and only when the lens is used at its widest apertures. Wide open at ƒ/3.5, the corners are 2/3EV darker than the center; at ƒ/4, this amount reduces to just a half-stop. By ƒ/5.6, corner shading has all but disappeared. The 85mm ƒ/3.5 micro is optimized well to prevent distortion: the lens shows just +0.2% barrel distortion in the corners, which is fairly easy to correct in post-processing software (if it's vital that your straight lines are truly straight). The lens takes about one second to go through its focusing range, and by using the AF-S autofocus motor, it does so very quietly. Point-to-point autofocusing happens very quickly; autofocus results can be overridden at any time by simply turning the focus ring. Attached front-mounted filters won't rotate during focus operations. The main attraction of the lens is its macro functionality; to be specific, a full 1:1 reproduction ratio. Minimum close-focusing distance is 28.6 cm (just over 11 inches). This makes for a comfortable working distance for the lens; just far enough away to avoid scaring away critters, and close enough to make easy adjustments to a static scene. The addition of VRII is also useful, allowing some macro shots to be made without the use of a tripod. It's worth noting that the maximum aperture of the lens decreases as the lens is focused closer to its minimum distance. We have set out a table which indicates the aperture size relative to the focus length. The lens is fairly long for a fixed-length prime: around four inches. However, the non-metal construction keeps the weight down, at just 12 ounces (355 grams). The lens mount is metal, and the filter threads are plastic. 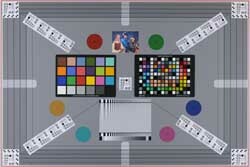 The lens is composed of a generous number of elements: 14 in total, in 10 groups, and one of those is an ED element. The barrel uses Nikon's normal black matte finish. Filter size is 52mm. The lens incorporates Nikon's Vibration Reduction (VR) system that is good at countering camera shakes up to four stops (according to the manual). The lens has two control switches: one for focusing (M/A or M) and one for VR (on or off). A windowed distance scale is present with feet, meters and reproduction ratio on it: there is no depth of field information, unsurprisingly. The focusing ring on the lens is rubber, with deep ribs, 1 1/8'' wide. The focus ring turns all the way around the lens with soft stops at closest focus and at infinity. The lens will focus well past infinity. Manual focus is smooth, and there is plenty of throw, great for dialing in the best focus with a macro shot. Because the lens uses an internal focusing design, there is no extension of the front element during focus operations, and as previously mentioned, the front element won't rotate either. The included circular HB-37 lens hood uses a bayonet mount, and reverses on the front of the lens for easy storage. The interior of the lens hood is a smooth flat black, and the whole thing adds 1 1/2 inches to the overall length of the lens when employed. Nikon's ''other'' VR-enabled macro lens, the 85mm ƒ/3.5 shows itself to be sharper at wider apertures, and can achieve sharper performance when stopped down as well. On a sub-frame camera the 105mm operates as a 158mm lens; CA, corner shading and distortion are excellently handled, as well or better than the 85mm. It's a full-frame lens, where the 85mm isn't. For about the same price, the Nikon 60mm ƒ/2.8 micro is an option. Though it doesn't offer vibration reduction, it's a full-frame lens, and slightly sharper than the 85mm ƒ/3.5. CA is slightly higher, but distortion on the D200 was essentially zero; corner shading was really only an issue with the lens mounted on a full-frame body. We haven't yet reviewed this lens, but if it's anything like the 24mm ƒ/2.8 PC-E we reviewed, optical quality should be excellent. Clearly, you only need this lens if you're interested in tilt/shift operations. Slightly less expensive than the Nikon, Tamron's 90mm ƒ/2.8 doesn't feature optical stabilization, but in other respects its a comparable macro lens, offering 135mm equivalency on a sub-frame camera. The lens is a full-frame lens, and optically it's very good: excellent performance is obtained even by ƒ/4. CA, corner shading and distortion are excellently handled, as well as or better than the Nikon 85mm. If you're not interested in the full-frame lens, Tamron also offers a 60mm ƒ/2 alternative specifically for sub-frame. The Sigma 70mm is one of the sharpest lenses we've ever tested, providing excellent results at ƒ/2.8 and only becoming slightly sharper as it's stopped down. It doesn't feature optical stabilization like the Nikon, but it has other features to recommend it; it's a full-frame lens, costs less than the Nikon, and has excellent performance in resisting chromatic aberration, corner shading and distortion. On its own merits, the Nikon 85mm ƒ/3.5 micro is a good lens; it shows a slight defect in the top left corner that could be distinct to just this sample. Apart from that, it's a sharp lens, especially when stopped down to ƒ/8 or smaller, and the addition of VR is very useful. The overall population of macro lenses in this focal length is becoming quite large, and compared to other lenses in the category, I'm not sure if there is any one feature which would make this lens a must-buy. Plastic construction; over-magnifies some subjects; a bit of flare shooting toward the sun. Now that the price of used ones is dropping, I finally bought one of these, and have been comparing it to one of my 40mm f/2.8G DX AF-S Micros. I've now shot many pairs of images with my D7200 at f/8, .NEF 14-bit lossless, and then converted to 1200 pixel vertical .JPGs for identical processing. In briefest summary, they're both great lenses. The choice is mostly a matter of personal preference. They're both lightweight and handy to use at their respective focal lengths. The 85's VR is useful indoors, where I've shot knick-knacks easily at 1/6 second and down to 1/3. There's not a huge difference over the 40 without VR, when I can hold the camera steadily, bracing my elbow against something. But even then it is noticeable if I look for it. So the 85's VR will help in museums. Of course, this lens magnifies everything, relative to the 40, by a factor of 85/40. "Everything" includes how far you can be from a subject and get the same size image, as well as how much larger the image will be if you shoot from the same place. But that's only part of it. It also magnifies the effect of slight breezes on little flowers on flimsy stalks, for which VR obviously can't compensate. This seems to affect autofocus performance with this lens, as well as image capture generally. Also, depth of field is considerably decreased by the longer focal length. So getting closer to a small subject with a 40 can have its advantages. Yes, more light can get between the camera and the subject with the 85. But that's just one factor, which can be compensated for by carefully noting where the light is coming from and positioning accordingly. Also, being farther away means you don't have to breathe in a lot of pollen, or risk being stung by a bee visiting "your" flower, and you can photograph small subjects without having to wade through brush and thorns. But when the subject is a flower or another isolated subject, against a complex background, this lens's bokeh is a bit rough, which bothers some people. So it's a fairly complex trade-off. For non-macro work, it's a different trade-off. The 40 more pretty closely reproduces what you actually see, which corresponds to a focal length, in DX cameras, of about 35mm. The 85 magnifies it. So a tree that looks great to the eye becomes too big to fit into your frame...but its details can be nicely captured. In most respects, the lenses are identical, only differing by size, focal length and the 85's VR. Resolution is essentially the same at f/8, which is what I usually choose, although I might go to f/11 with this lens, for extra depth of field to offset the reduction from its longer focal length. I've tried using this lens and the 40 with extension tubes, to get even closer or produce more magnification. They work, but autofocus is not easy. So if you want to use extension tubes, you may have to settle for manual focus. This is in addition to the fact that they cut down light transmission, which would be a problem in museums, for example, requiring higher ISO or (even) slower exposure. A small aperture, f/11 better than f/8, improves depth of field, and, I think, resolution in good light. I'll keep both lenses with my D7200, and extension tubes, and will choose whatever will do the job. Which one would I suggest? For most people, shooting various subjects, I'd recommend the 85. Sharp, small, light, cheap, and VR! Could have been a bit faster, & very plastic! I love using this on my Nikon 1 cameras, but it works on my FX cameras as well (you need to do some cropping afterwards, if you use FX mode). The only con is that it isn't faster than it is — I'd a love a f/2.8 version! 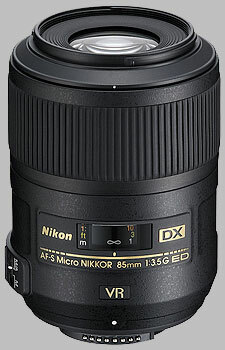 This is a nice lens for shooting macro/micro up to 1:1 on a Nikon DX body. Can be used on FX, with central portion of sensor active. VR is a bit of a waste, as in close up work, there is more in and out, as opposed to side to side motion, which VR does not help with. The lens is a bit slow for good portrait bokeh. So is pretty strictly reasonably priced macro lens. When I decided to buy a macro lens my choices (after a lot of internet research) came down to: Tamron 90mm, Nikon 60mm AFS, Nikon 105mm (old model, 2nd hand) or the new 85mm VR. The 105 had already been sold when I arrived at the camera shop, I realized that 60mm was too short, the new 105VR too expensive so it would be either the Tamron or the 85 mm Nikon, to be used on my D300s. Purely based on trying the two lenses in the shop I bought the Nikon, because the Tamron was slow in focussing, made a lot of noise and extended its tube when getting closer. I do not regret my choice because the Nikon gives me supersharp images. The VR is a great addition because sometimes you are in strange positions to capture a particular insect and you can move around faster too without a tripod. Also the focussing is quite fast and very silent. And as a bonus it is a great portret lens. Higly recommended!! I have owned this lens for about a month and have used it quite a bit. Having previously owned a Tamron 90mm f/2.8 macro, I prefer this lens. The optical performance is similar, but the handling and autofocus is far better. I especially like the manual focus override feature common to all Nikon AF-S lenses. And the very effective vibration reduction feature is a real plus which the Tamron can't match. The SLR Gear review was relatively lukewarm, yet if you compare the blur plots of this lens with the legendary Nikkor 200mm f/4 micro, this new 85 is actually better at f/8 and smaller apertures, which is where I use it most. I also own a Nikkor 200/4 micro, and can tell little difference in image quality between the two lenses. The 200 has the advantage of greater working distance, but the disadvantage of large size and weight. This new 85 micro is the perfect macro lens for long hikes into the back country in search of wildflowers and small critters.